Humans have considerably transformed the natural landscape of the earth. It is estimated that over half of the earth's habitable land surface has already been significantly altered by human activity in some form. The consequences of such manipulation for the overall biodiversity have undoubtedly been profound. The consequences of such manipulation of the habitat for elephant populations in the two continents must be examined. This is not a subject that has been rigorously researched, and only general observations are available. The most pervasive and detrimental impact has been the loss of habitat and its fragmentation, a process that continues even today in many parts of the elephant's range. The range of the Asian elephant typifies this situation, as does that of the elephant in West Africa (appendix 1). The result has been escalated conflict with agriculture, retaliation from people, and the creation of nonviable elephant populations. The loss and fragmentation of natural habitat is usually accompanied by a corresponding increase in settlements, agriculture, and density of humans. Mutual antagonism between the humans and elephants results in a reduction and eventual elimination of the latter. Ian Parker and A. D. Graham proposed an inverse relationship between elephant and human densities. Their model indicated that, at the national or subcontinental scale, the density of elephants declines linearly with the natural logarithm of human density. A more rigorous analysis of higher resolution data from Zimbabwe's Seb-ungwe region by Richard Hoare and Johan du Toit added a new dimension to this broadly expected trend. 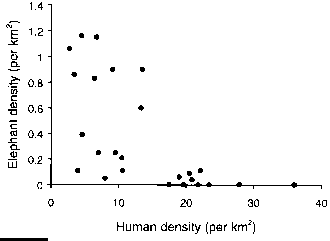 There was no clear relationship between human density and elephant density until a threshold human density of about 15 persons/km , after which there was a sharp drop in elephant density (fig. 8.9). They suggested that this could arise from elephants moving away from a disturbed region once the threshold of tolerance had been reached and not necessarily from elephants dying out locally. forests of Gabon avoid roads and villages, presumably because they associate these with humans who kill a few animals each year near settlements. As humans expand into natural habitats and fragment them, the verdict is clear—elephants eventually decline. When humans transform the habitat in other ways, such as through extraction of timber and other products, replace natural vegetation with monoculture plantations, use fire to manipulate the vegetation, practice shifting cultivation, graze their livestock, or change local hydrology without actually reducing the area of habitat, the implications for elephants are quite mixed. People may make the habitat less attractive or more attractive for elephants. The implications of such habitat manipulation for the management of elephants will be region specific and will depend on broader conservation goals (chapter 9). Some of these forms of habitat manipulation and consequences for elephants are now examined. Several observers have commented that elephants in tropical moist forests show a marked preference for secondary growth habitats over primary forest habitat. Logging for hardwoods as structural material or softwood for pulp and fiber is pervasive in tropical forests. Disturbance and light gaps promote the growth of bamboo, grass, and other weedy plants low in secondary plant compounds, thus making them attractive to elephants. Thus, Robert Olivier found that elephant densities in rain forests of peninsular Malaysia were about twice as high in secondary forest than in primary forest. He attributed this to the higher abundance of food plants in the former than the latter (214 versus 157 trunksful per 400 m ). The detailed investigation of elephant utilization and impacts in logged versus unlogged rain forests in Kibale, Uganda, by Thomas Struhsaker and associates further reinforces this view. Elephants used heavily logged forest more than lightly logged or unlogged forest. This was not due to any increased abundance of saplings or pole-size stems in the logged forests (the opposite was true), but due to the increased growth of herbaceous and semiwoody plants, which formed a tangle and attracted elephants. Once the elephants began to use the logged forests more intensively, the damage to young woody stems also suppressed their recruitment into trees, thus maintaining gaps and favoring herbaceous growth. People also extract a large variety of nontimber products from forests and savannas across the elephants' range in the two continents. These include fuel wood; material for house construction and thatching; livestock feed; many kinds of fruits, flowers, roots, bark, and leaves for direct consumption or as ingredients in medicine, food, and nonfood products; lichens; and mosses. While some of this is subsistence-level extraction, these may also cater to a wider commercial market. Extraction can adversely affect elephants if the levels exceed the natural productivity of food plants, resulting in a decline in the available forage biomass and changes in composition of plant communities. Although there have been several investigations on the nature and volume of extractions in tropical forests, there are practically no published studies that have clearly demonstrated how extraction regimes have affected forage avail ability for elephants. Often, several factors, such as fire, rainfall fluctuations, browsing by livestock, and even elephant utilization, interact with extraction, making it difficult to separate the various influences. Ramesh Kumar's study of elephant habitat in Hosur in southern India indicated that extraction of forest products by people had the greatest influence in tree population declines, when considered along with fire and damage by elephants. C. S. Silori and B. K. Mishra documented intense "biotic pressure" through woodcutting, including plants consumed by elephants, in the dry forests of Sigur, adjoining Mudumalai Sanctuary, but did not present any data on changes in biomass or tree populations. The conversion of natural vegetation to monoculture plantations usually lowers forage availability for elephants. In Asian habitats, these are commonly teak (Tectona granáis), sal (Shorea robusta), wattles (Acacia spp. ), pines (Pinus spp. ), eucalypts (Eucalyptus spp. ), silver oak (Grevillea robusta), and several other species of hardwood, pulpwood, fodder, and fuel wood. In the southern Indian elephant range of the Nilgiris and Biligirirangans, I estimated that about 10% of the natural forest areas under the administrative control of the state forest departments have been converted into monoculture plantations. This does not account for the more historical conversion of forests into plantations of tea and coffee. 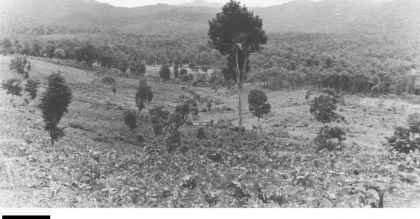 Several of these plantation habitats, such as wattle, eucalypts, silver oak, and pines, are virtually useless for elephants. Others, such as teak, are utilized to a certain extent (bark of teak is consumed to a limited extent), but the availability of other forage plants, particularly favored species of the Malvales, was much lower in these plantations than in adjacent natural forest. The use of fire in elephant habitats again has mixed consequences. Fires are set by loggers to cover up illegal extraction, by livestock graziers to promote a new flush of grass, by local villagers and forest produce collectors for better visibility, by poachers to cover their tracks, or even by administrators as part of management objectives. The immediate effect of fire is a drastic reduction of forage, both grasses and foliage of woody stems. This may force elephants to move to other areas to seek green biomass. The new flush of palatable grass, high in protein, attracts them back for intense grazing during the wet season. Fires may also act synergistically with elephants and other browsers to convert woodland into grassland, which may be incompatible with management goals (chapter 6). Even if fires do not create grasslands, they may cause substantial changes in species composition of dry or moist forest by promoting the growth of fire-resistant species. Grazing of livestock (mainly cattle, buffalo, and goat) within elephant habitat is common in South Asia and East Africa. This may potentially affect elephant populations through competition for forage, changes in vegetation composition, disturbance to herds, and transmission of diseases. Much depends on the local densities of livestock populations. The evidence for competition between livestock and elephants is generally weak for savannas and deciduous forests with tall perennial grasses. The productivity of such grasses is usually far in excess of consumption by elephants and even other herbivores in the community. For instance, I found that elephants managed an offtake of only 3%-4% of primary production of tall grasses in several habitat types examined in the Biligirirangans irrespective of the levels of consumption (2%-42%) by livestock during a drought year. Competition, however, may occur for short grasses that grow to sufficient height by the late wet season for use by elephants. Excessive livestock densities may remove much of the short grass production, forcing elephants to scarify the soil by scraping with their feet to remove grass stubble. Livestock grazing in the Nilgiris is also associated with removal of dung for sale outside as manure, a process that results in loss of soil nutrients. In northern India's Rajaji National Park, the lopping of trees by Gujjars, a pastoral community, to provide fodder to their buffaloes has considerably degraded the habitat. The movement of livestock there also poses a direct disturbance to elephants, especially at water holes. Livestock may also transmit parasites and diseases to elephants. However, Milind Watve found that elephants using areas grazed by livestock did not have higher intestinal parasite loads compared to those using livestock-free areas in the Nilgiris. Anthrax and foot-and-mouth disease are two diseases that could be passed from livestock to elephants. The evidence for transmission of anthrax is only anecdotal, while foot-and-mouth disease occurs only sporadically in elephants. Shifting cultivation is practiced extensively in Asian seasonal moist forests, including those in central and northeastern India, Myanmar (Burma), Thailand, and Indochina (fig. 8.10). During the early stages of shifting cultivation, the mosaic of primary forest and secondary vegetation in various stages, from grassland to regenerating and medium-stature forests, increases the carrying capacity for elephants. Elephants are attracted to such areas of secondary vegetation. On the basis of the presence of dung, Christy Williams and A.J.T. John-singh found higher relative elephant densities in land that had been fallow for 1-10 years compared to pure grassland, plantations, or primary forest in Meghalaya in northeastern India, in line with my qualitative expectations. 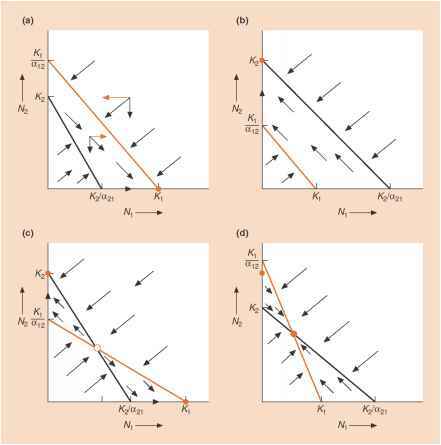 At the same time, it should be kept in mind that there are increasing human population pressures in many regions that have significantly reduced the period of rotation of sites of cultivation, resulting in depletion of topsoil and its nutrient status and keeping the larger landscape in a degraded state. Manipulation of the natural landscape is thus a double-edged sword. On one hand, it may create more-favorable habitats for herbivores, including elephants. It also allows pernicious weeds to penetrate and spread, thereby increasing the risk of fire, suppressing native plants and their regeneration, and even decreasing forage for large herbivores. Lantana camara, Chromolaena odor-ata, and Mikania cordata are examples of such weedy plants that have spread extensively through disturbed forests in India and other Asian regions. The implications of habitat manipulation for the management of elephant populations have to be evaluated in each instance in relation to broader conservation goals (chapter 9). A former site of shifting cultivation in the Biligirirangans in southern India. Although this form of cultivation is not much practiced in these parts, it is very common in central and northeastern India and other parts of Asia. Abandoned sites of shifting cultivation attract elephants.